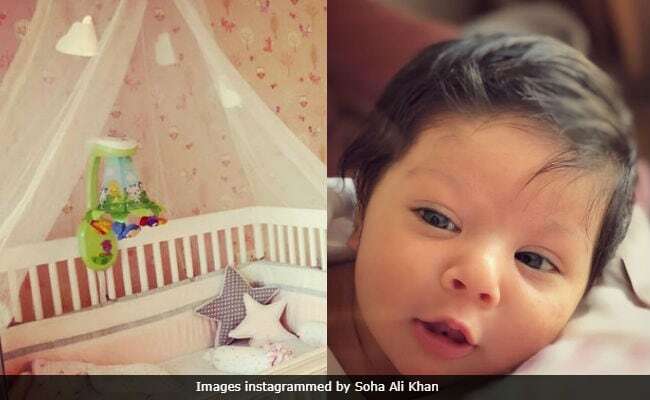 For Soha Ali Khan her baby daughter's room is "most important room in the house"
After sharing the first picture of her daughter on Children's Day, actress Soha Ali Khan shared pictures of her baby's nursery on Instagram. On Wednesday, Soha Ali Khan shared three pictures (in one collage) of Inaaya Naumi's nursery, which she said the designer made with "elegance, good taste and most of all with love." For Soha, who recently authored The Perils Of Being Moderately Famous, her baby daughter's room is "most important room in the house." Little Inaaya, who was born in September, stays in a pretty soft pink and white room, which has a baby crib, a sofa, an ample cupboard for her belongings. Take a look at pictures instagrammed by Soha Ali Khan. Soha Ali Khan is married to actor Kunal Kemmu and on Children's Day, the first time parents shared the first picture of their daughter (we are not counting the picture of Kunal and Inaaya shared by Soha last month). In this picture, Inaaya resembles her cousin Taimur, who is the son of Kareena Kapoor and Saif Ali Khan (Soha's brother). Before that, Soha had shared this aforementioned picture of Kunal spending some father-daughter tome with Inaaya. Soha Ali Khan has featured in films such as Rang De! Basanti, Tum Mile, Khoya Khoya Chand, Ahista Ahista and Saheb, Biwi Aur Gangster Returns. She was last seen in Ghayal Once Again and before that in 31st October - both of which released in 2016. Soha's next is Saheb, Biwi Aur Gangster 3. Kunal Kemmu starred in recently released blockbuster Golmaal Again.